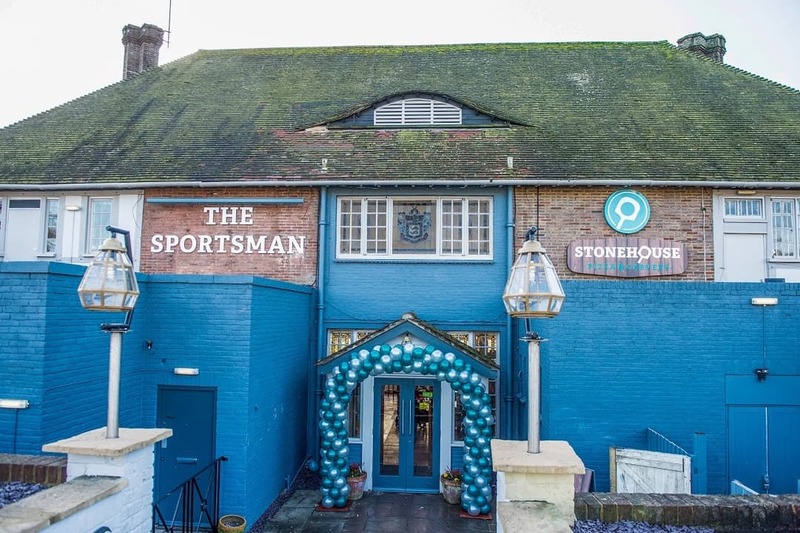 Last week we were invited for a meal at The Sportsman in Withdean, North Brighton as they’ve recently had a refurb and rebrand – they’re now a Stonehouse Pizza & Carvery restaurant. The Sportsman is at Withdean Stadium and has a large dining room, a spacious bar area and outside tables, though sadly it was raining so we stayed inside! The menu is really varied, covering everything you’d expect to find on a pub menu, but many dishes have got twists, like the Mac n Cheese balls and the skinny pizzas (30% fewer calories than the regular ones). You can choose from a variety of Burgers, Pizzas and carvery meals. You can help yourself to vegetables, chips, and salad, and the burgers and carvery meals have a go large option for £1.50 extra. We decided to skip starters in favour of puddings, though there is a great selection and you can choose five starts for £13.99, which would be great for a tapas style meal with friends or for a few people to share. 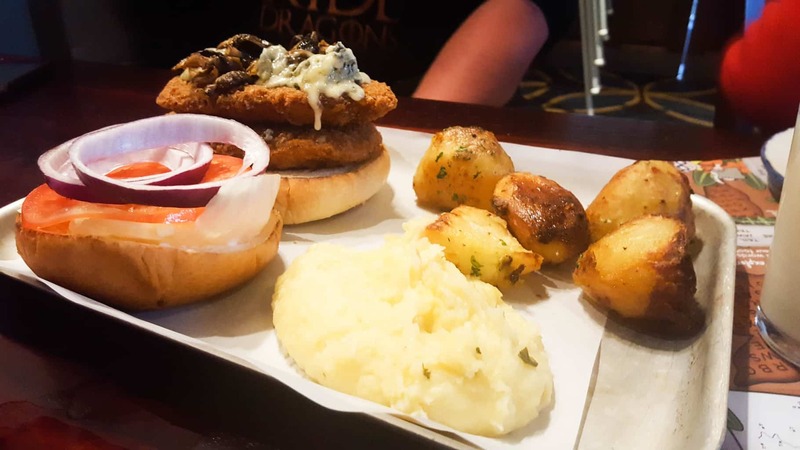 Sam chose the double Buttermilk chicken burger with the Blue Moo n’ Shroom topping, which arrived on a baking tray. I always think anything other than a plate for food is a bit of a gimmick but it looked modern and didn’t put Sam off eating it! Stacked high inside a toasted brioche bun including onion and tomato. 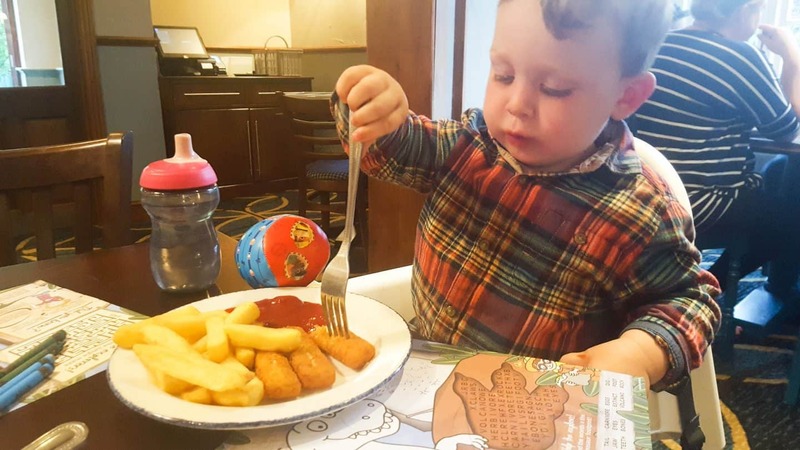 Sam oddly chose to have roast and mash potato as his sides, but that’s the glory of a buffet service in a restaurant – you can get why you want on your plate without irritating the waiting team by faffing about with your order! I chose the ‘go large’ carvery, though my eyes were too big for my belly and I couldn’t finish it all, though I gave it a good try! Go Large gets you a pork sausage, extra meat and a giant yorkshire pudding, though I was only served a normal size one and didn’t realise till afterwards! the veg all tasted and looked fresh, though the stuffing was pretty dry. I loved that I could help myself to as much sauce and gravy as I needed though, and a second helping of vegetables. The kid’s menu really varied with five main courses and four pizza choices. It meant we had no problem choosing meals for Athena and Arlo. She wanted ‘Cheesy Pasta’ which was available in the form of Macaroni Cheese and Arlo had Fish Fingers and chips. 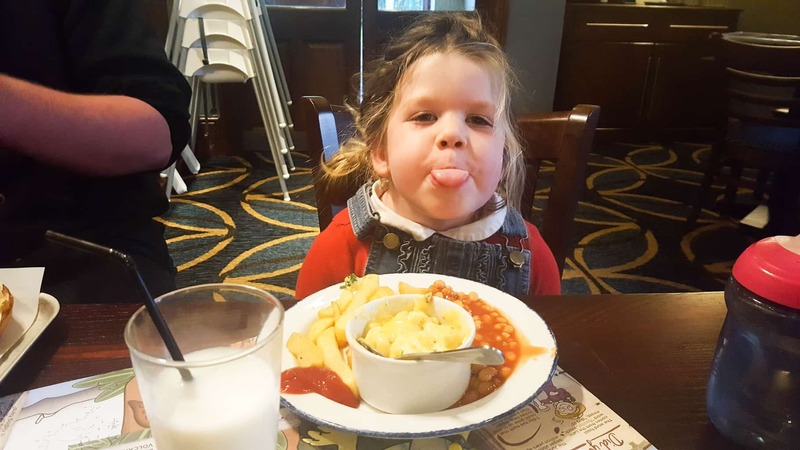 Of course the kids could choose their sides, so Athena had beans with her Mac n Cheese, as you do! Of course they were more interested in pudding, choosing the bottomless ice-cream sundae so they could add sprinkles and sauces and generally make a bit of a mess! Sam and I had already decided on our desserts before we ordered our mains, as we’d spotted an advert for ‘Freak Shakes’ and they looked AMAZING! 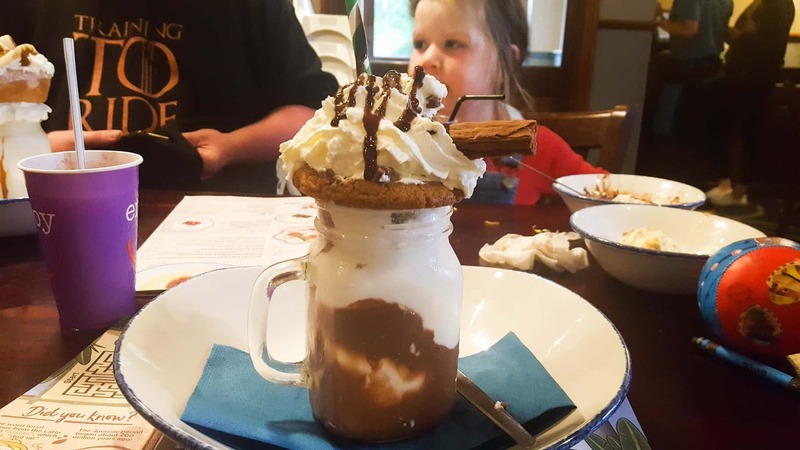 Milkshakes with oodles of whipped cream and various toppings – mine was a chewy cookie and brownie chunks with chocolate sauce, and Sam had the Banoffee Donut. They were both super delicious and super naughty (I’ve fallen off the slimming world bandwagon anyway, so I didn’t feel that bad!) I also had a glass of ‘Frosé’ with my dinner, basically a rose wine slushy – who knew? How scrummy? It took me a while to scoff it, but I managed it in the end! 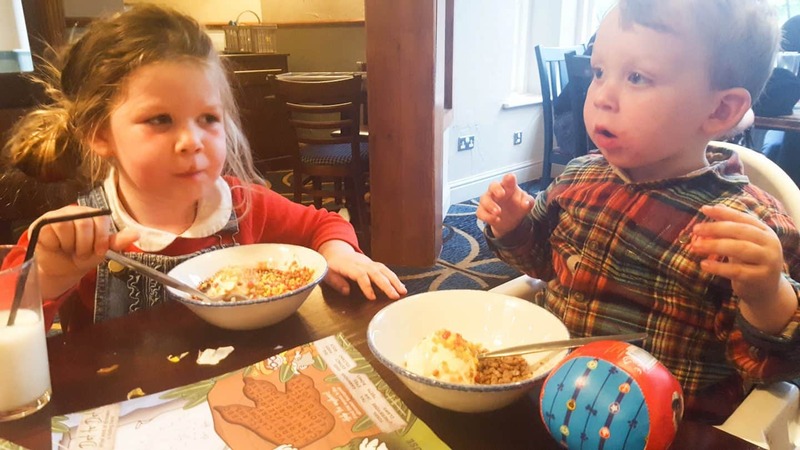 The Sportsman is perfect for eating out with kids, it’s a relaxed atmosphere where there will likely be a lot of other families, and ordering at the bar means you can order when you’re ready instead of waiting during busy times. Depending on what you order you can of course get your food almost immediately, but even the kids meals and Sam’s burger didn’t take too long at all. 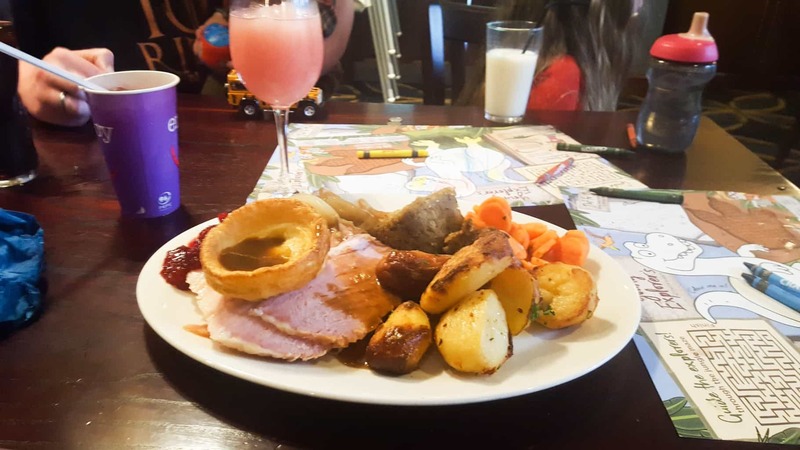 It was fairly busy by the time we left with about 90% of tables occupied but all our empties were cleared quickly and the kids were kept supplied with crayons and kids menus which kept them happy. Arlo was in a highchair that was clean with working straps too. We needed a few more napkins in our little bucket of cutlery that sits at the end of the table but we did have kids making an ice creamy mess! There is a large, free car park on site as well as a bus stop with buses into town regularly. 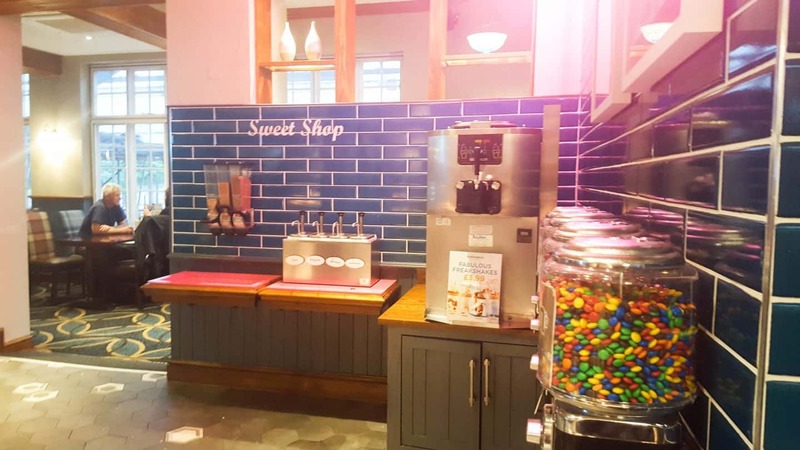 They serve an unlimited breakfast from 8 – 11.30am, and then the carvery is served until 9.30pm daily. The Sportsman is on Tongdean Lane and you can view current menus and offers here. We were provided with a complimentary meal and drinks for the purpose of this review. All words and opinions are my own.